With the GST roll-out effective July 1, the tax applicable on restaurant bills has been made quite clear. Yet customers seem to argue with the restaurant staff on rates applicable, especially for take-away and home delivery orders. I have provided below the specific clauses applicable and a copy of the advertisement issued by the department specific to restaurants for your reference. You can take a print-out of this and display/show it to customers who have queries on this. 1) Any business with less than 20 lakhs annual revenues need not even register under GST nor do they need to pay anything under GST. So most small roadside eateries are fully exempt from GST. 2) Small restaurants with annual turnover less than 75 lakhs. Note that if a small restaurant has 2 branches under the same legal name with the same GST number, the total revenues of both the restaurants are taken into account to determine the 75 lakhs limit. Such restaurants with annual revenues less than 75 lakhs can register under GST under the composition scheme and the applicable rate of GST is 5%. 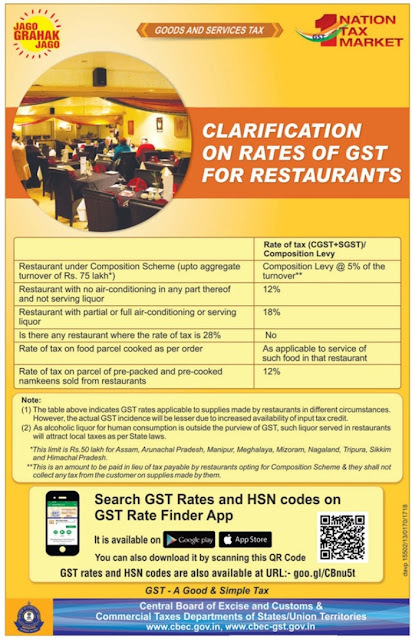 Like in the earlier composition scheme under VAT, the restaurant cannot charge the 5% to customers. i.e. If an item is priced at Rs.200, the customer can be charged only Rs.200. 5% of Rs.200 is then payable by the restaurant as GST. Note: For restaurants in the following states, the annual turnover limit will only be Rs. 50 lakhs - Assam, Arunachal Prdesh, Manipur, Meghalaya, Mizoram, Nagaland, Tripura, Sikkim & Himachal Pradesh. 3) Restaurants without air-conditioning - the rules state that the restaurant should not have AC in any part of the premises. So restaurants with a non-AC section and AC section will still have to charge 18% GST. 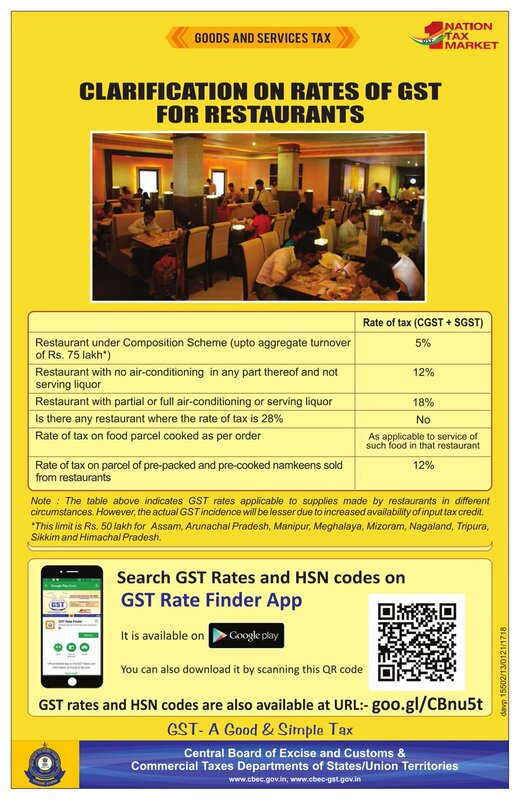 In practice some restaurants are charging 12% GST for the non-AC section and 18% GST for the AC section, if the AC section in a separate floor with a separate entrance. This seems to be incorrect as per the definition as the GST number is the same for the AC and the non-AC restaurant in the same premises. 4) When customer order from third party websites such as Swiggy, Foodpanda, Zomato, UberEats etc., the respective restaurant's GST rates need to be charged. If any service charges are levied by these sites, GST of 18% is applicable on the service charges. E.g. If a customer places an order on Swiggy from a non AC restaurant for Rs. 200 and a delivery charge of Rs.40 is levied by Swiggy, then the GST chargeable should be: 12% GST on Rs.200 + 18% of GST on Rs.40 = Rs.24 + Rs.7.20 = Rs.31.20. Total bill with GST = Rs.200 +Rs.31.2 = Rs.231.20. Google search throws up several results - have provided a few of those links for easy reference.